Explanation: Fantastic shapes lurk in clouds of glowing gas in NGC 6188, about 4,000 light-years away. The emission nebula is found near the edge of a large molecular cloud unseen at visible wavelengths, in the southern constellation Ara. Massive, young stars of the embedded Ara OB1 association were formed in that region only a few million years ago, sculpting the dark shapes and powering the nebular glow with stellar winds and intense ultraviolet radiation. 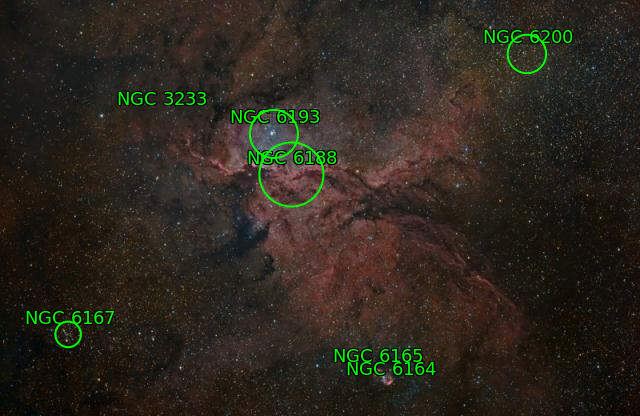 The recent star formation itself was likely triggered by winds and supernova explosions, from previous generations of massive stars, that swept up and compressed the molecular gas. Joining NGC 6188 on this cosmic canvas is rare emission nebula NGC 6164, also created by one of the region's massive O-type stars. Similar in appearance to many planetary nebulae, NGC 6164's striking, symmetric gaseous shroud and faint halo surround its bright central star near the bottom edge. 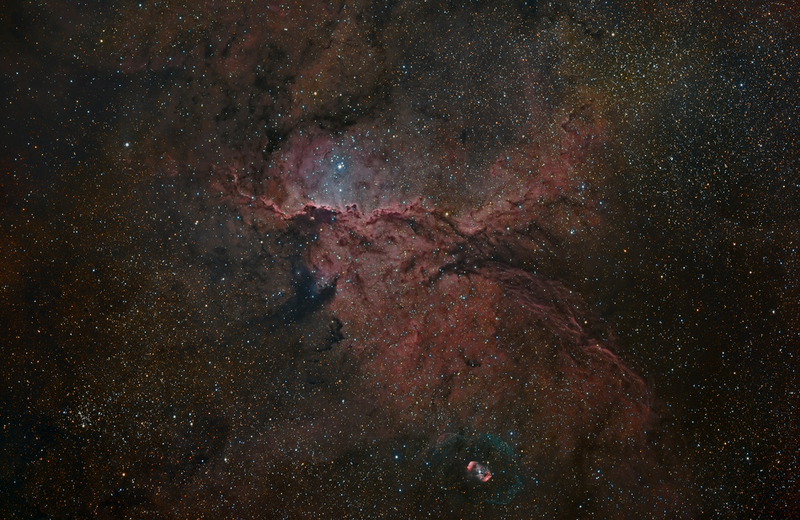 The impressively wide field of view spans over 3 degrees (six full Moons), corresponding to over 200 light years at the estimated distance of NGC 6188. Narrowband image data has been included in the natural looking colour composite, adding to deep red emission from hydrogen and sulfur atoms and the blue-green light of oxygen atoms.